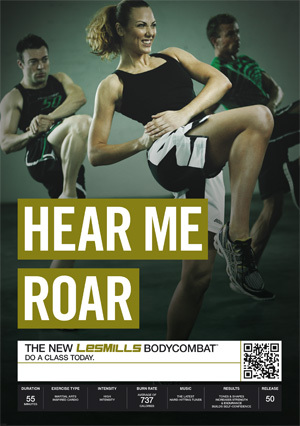 44 Responses to "BODYCOMBAT 50 tracklist"
thank you so much. Listening the songs now. Looking forward to seeing the other track lists! Thanks Matt! Couple of awesome tracks in there for sure! Looking forward to seeing What’s Up 🙂 Love that song! I am very disappointed with the last song. You could end with the original for a more relaxation. the rest of the Tracklist will be fun to hear and move with them. So Nessaja was that track five you loved that much. I can see why 😀 that remix rocks! I know Adrián it rocks!!! Guess what Glen – my module is tomorrow (49) and I got assigned 4 and 5 🙂 Oh yeah… I like the song, well I like the Attack and Pump versions. The original is too loud. Track 5 Chad that’s awesome! Good luck! Adrián its the step over side kick. Step one leg behind the other to cover distance. I used to use a similar kick in TKD (in fact was my favourite kick behind spinning back kick) but we did the sliding side kick. Thanks for the reply! I also trained TKD some years ago and was hoping for some spinning kick, but I guess it would be too tricky for BC, hehe. And thanks also for the tracklist and all the updates you post here! The spinning back kick IS in Shut Up and Drive believe it or not! Yeah, but the Spinning Back kick in “Shut up and Drive” is only a performance finisher. Loving the sound of the new(ish) Side Kick! Thanks for posting the tracklist, very exciting to see “Eye of the Tiger” back, can’t wait to see what moves go with it. See it next Saturday at my quarterlies. In PPCA-free land, we are always desperately waiting for the new releases so we have some more back catalogue to play with! Nice work Glen, THANKS 🙂 do you know when this release will be launched? ANI it’s launched at different dates all over the globe. For example we’ll start launching here in NZ from this week – same with australia and a few other countries. The States and UK are usually later – and I’m not sure about Portugal sorry! Would expect in the next month or so though. best to speak to your local LM agent. Do we need ‘Bionic hearing’ to hear the sound effects of Frozen? I can hear the sword katta effects – “Schwing” x2 but can’t hear the ‘Bish’ ‘Bish’ sounds. This is on my ipod at full blast. Can hear it on the dvd though. Thanks Cristian – yeah it’s tough youtube keep removing the music! I’ll try to update – 3 should work but sometimes there are different copyright laws in each country. Hey is the first track the real first track? cause i saw a video-performance of the first track from dan and rachel and your first track doesnt match up with it. ? tam – now I listen you’re right it is slightly different! It’s sometimes hard to find exact mixes online – I’ll search for a better one or let me know if you find one. Absolutley love your blogs. Just read BC51 and i’ve only just got the training materials for BC50 so will be learning that over the xmas period. Can you do me a favour, in BC50 in the lower body warm up around 4.00 minutes in, what is the word said, it sounds like shi* bare, but on some (not all) lyric list on the websites it says ship or shi*. Just so I know if it is the bad word, I can make a noise over it. Your blogs are great…keep them up. OMG BC 50 is an amazing rls!! But I HAVE TO know something…..are D&R divorced? or is it just a mistake that Rach is called “Newsham” at the beginning of the DVD?? Glenn, do you have the punch/kick/etc count for BC50 like you had for BC49? No Darren I don’t sorry. I didn’t work that out – I’m sure someone will though – it’ll be high! Thx for your great blog! I follow on your blog the new playlists : Thanks a lot for all the pleasure I have to listen to this ! But how to listen all the playlist without interruption ? Is it possible on Youtube ? Hi Arwenn – I think some people have made playlists using the likes of Spotify – or you can create a playlist in youtube quite easily.